Luiz Felipe Scolari’s shares are again on the rise as our coach have returned to a more peaceful co-existence with the squad – much due to the crucial role of Cesar Sampaio – and, even more importantly, with Palmeiras’ directors. Or rather with president Arnaldo Tirone. The tug of war between director of football Frizzo and Big Phil left the former weak, on the brink of disappearing from the scene. Instead, we’ve seen Tirone himself step up and, for example conduct player negotiations. Felipão couldn’t be happier with roughly a month to become the second coach in history to most times have led Palmeiras. In his two periods at the club – mid 1997 to mid 2000 and as of July 2010 – he’s accumulated no less than 360 games: 172 victories, 101 draws and 87 losses. Only Osvaldo Brandão (580 games) and Vanderlei Luxemburgo (367) are a match. The recently signed master sponsor agreement with South Korean car manufacturer KIA Motors will also increase Big Phil’s exposure: KIA will pay part of his salary and the KIA logo will be branded on his clothes. In addition, he will be driving around in a nice KIA car. KIA president José Luiz Gandini makes no secret of his intention to really use the “Scolari brand” in his full favour. Yes, he’s hot, our Scolari. And there’s more. The International Federation of Football History & Statistics (IFFHS) recently published their ranking of the best Coach of the 21st Century. 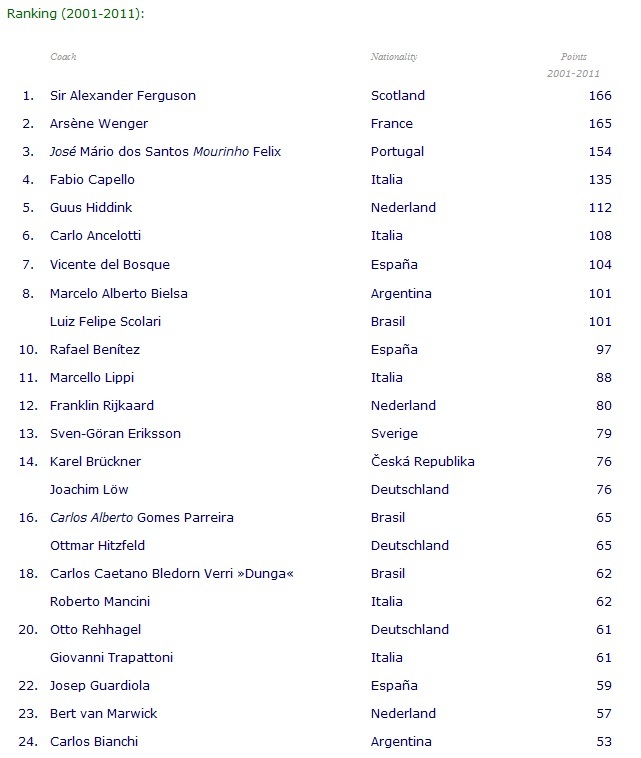 Scolari is number 8 on the list. Obviously, these kind of rankings are subject to criticism and this one is no exception: how should we grasp that former Brazilian national coach “Dunga” is number 18, ahead of for example Pepe Guardiola? Go figure. Still, great for Scolari to be on the list and in the top 10. Check out the top 24 rank above. This afternoon, Argentine striker Hernán Barcos was finally and formally introduced to the masses. With all papers in order, “the Pirate” is available for play tomorrow (Wednesday) against VX de Piracicaba. His jersey carries the number 29. During the presentation, he spoke fondly of how he was received at Palmeiras by staff and players alike. Apparently, he feels comfortable. Good luck Barcos; may you bring glory to Palmeiras! Avanti!